+ Creating The LADDER involved hundreds of hours in research to develop classifications of features and an equal amount of time to enhance the images for a life-like appearance. + Photography cannot routinely capture features as depicted in The LADDER. There is always loss of detail regardless of the type of photography. 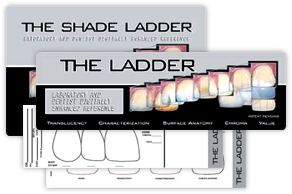 + Shade scanners cannot communicate the features as depicted in The LADDER. A numeric reading does not convey the true quality and character of features. + No other system allows for diagnosing, communicating, and fabricating esthetic restorations to an unchanging standard. + The LADDER is printed using the highest quality lithography on archival photographic paper; and then laminated for durability and sterilization purposes. + Studies show that the cost of 1 (one) re-make between a dentist and laboratory is $1500.00 in lost time. The LADDER pays for itself each time it is used!